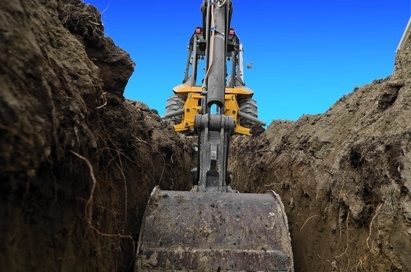 Utility Survey Corp. provides ground penetrating radar (GPR) services to locate a wide variety of subsurface targets such as underground utilities, underground storage tanks, old building foundations, septic systems, underground voids, etc. GPR is also used for detecting targets embedded in concrete such as conduits, rebar, post-tension cables, voids, etc. For this application GPR is often confused with, or compared to X-ray. However, GPR has many advantages over X-ray. It is safer (ie no harmful radiation) with no need to clear a safe area. 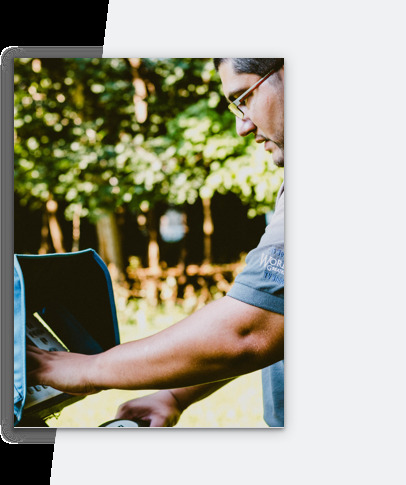 Imaging is in real time and available immediately on the job-site - where it matters. GPR is much more cost-effective than X-ray. In terms of performance, a GPR is more like an X-Ray machine than metal detectors. Without the common hazards associated with X-Ray machines, GPR can still provide high-resolution images for locating both metallic and non-metallic targets. For example, we have used GPR to locate buried PVC pipes and fiber optic cables, either directly or indirectly. If you want to find or map something buried underground or embedded in concrete, give us a call! 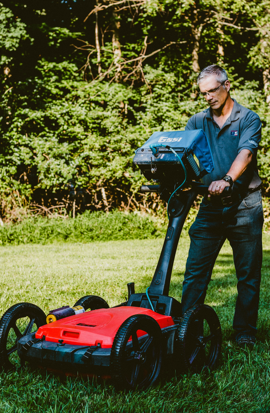 What is GPR and how is it useful? Ground penetrating radar (GPR) is a non-destructive scanning tool for subsurface imaging. It works by sending out electromagnetic (EM) waves and observing the EM waves bounced back. For locating underground targets such as a buried pipe, the EM waves are directed into the ground and the EM waves will be reflected by underground targets, thus revealing their presences and locations. Generally, the horizontal positioning of underground targets can be very accurate but their depths can also be estimated approximately. Unlike common metal detectors operating in the frequency range of KHz, GPR uses EM waves in MHz and GHz, making it possible to differentiate materials with their dielectric properties. As a result, it makes it possible for GPR to detect both metallic and non-metallic targets in great detail. Also, since the majority of wave energy emitted by GPR is directed downward, the interferences from surrounding and aboveground objects are minimal, making GPR scanning less restricted than using common metal detectors. GPR scanning can be conducted in both indoor and outdoor environments. In addition, the energy GPR emits is much less than a cell phone, making it a very safe scanning tool. Disruption to normal business operations at the job site with GPR scanning is minimal. Septic system delineation including septic tanks, septic fields, cesspools, etc. Although GPR is a great subsurface scanning tool, it does have its limitations such as very limited penetration depth in wet clay soils. If you are uncertain whether GPR is the right choice for your project, give us a call and talk to our experts in GPR. We do have other subsurface imaging options besides GPR which might just work great for your project! To make it simple to understand, it’s a type of radar. In one hand, just like other radars, it sends out radio signals and detects signals bounced back from targets. In the other hand, GPR usually direct its signals into the ground for reaching underground targets instead of those on the ground or in the air. The typical frequencies a GPR use are from about 10 MHz to about 3 GHz. How deep can you see with GPR? The GPR penetration depth varies with GPR antenna frequencies and soil/concrete properties. For locating small targets such as wire mesh in concrete structures, typically high frequency antennas (in the range of GHz) are used for high resolution images. The penetration depth varies from a few inches to about a couple of feet depending on the electrical properties of the concrete. For locating large targets such as underground storage tanks, typically lower frequency antennas (such as those from 200MHz to 400MHz) are used for better penetration depths. The typical penetrating depth varies from a few feet to tens of feet. In general, GPR works the best over dry sandy soils and worst over wet clayey soils. Is GPR the right tool for my applications/targets? Depending on the soil properties and the characteristics of the targets you are looking for, GPR may or may not be the right tool for your application. 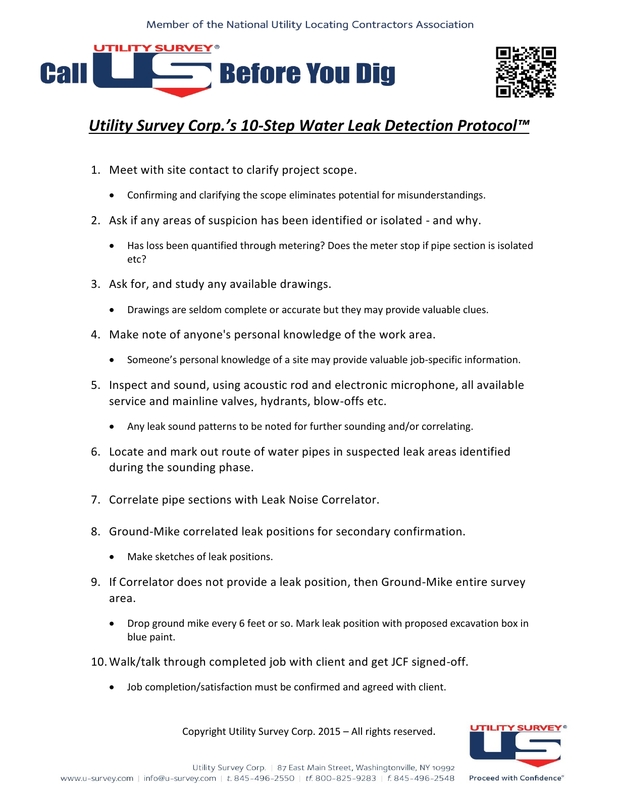 For a successful GPR survey, at least two conditions should be met. One is that the GPR penetrating depth needs to be good enough for reaching the target depth. The other one is that there should be enough property contrasts between the target and the hosting media (soils, concrete, etc.). Unfortunately, more often than not, we don’t know whether these two conditions are met until we try it at the very survey area/location.